How appropriate for 4th of July during the Civil War sesquicentennial! Today's story is "How a Boy Helped General McClellan Win a Battle." The various story posts have been proceeding alphabetically through my collection, so it was not planning on my part. I also confess this project helped me discover material sitting unnoticed on my shelves. Looking at Albert F. Blaisdell's Stories of the Civil War, I fondly recall discovering it at Hyde Brothers in Fort Wayne, IN. 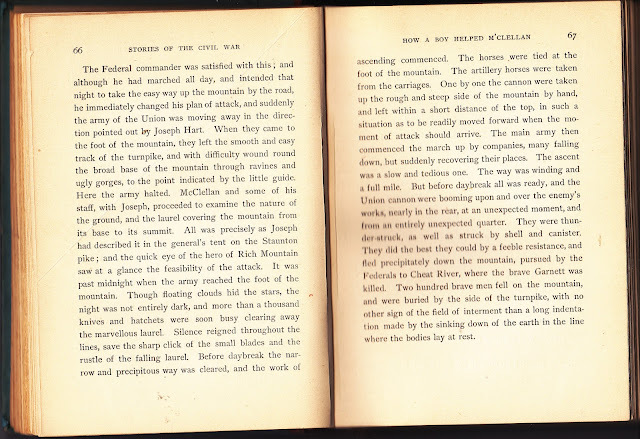 Even with all my Civil War programs, I've not been able to use the stories in it, so I'm delighted to share it here. I also want to thank the readers who have encouraged this series. Their comments have often come to me on Facebook or email instead of here on this site. Sorry others can't read them, but am grateful for the response. 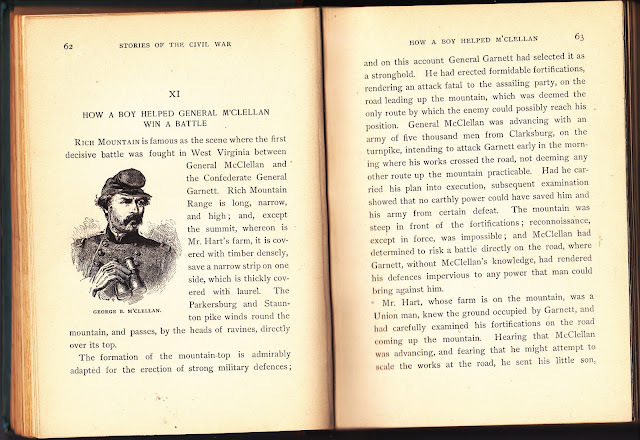 Now for a story of General McClellan, who was often faulted for his inaction. This gives an inside view of how he proceeded. For a fascinating overview of this general loved by his men, but the easy target for Union losses, the Wikipedia article is worth a follow-up look. There are lots of interesting stories in this book. I've decided to incorporate some of the prison information in my programs when I mention Will and Isaac Lerich's time at Libby Prison when reenacting as their sister, Liberetta Lerich Green. 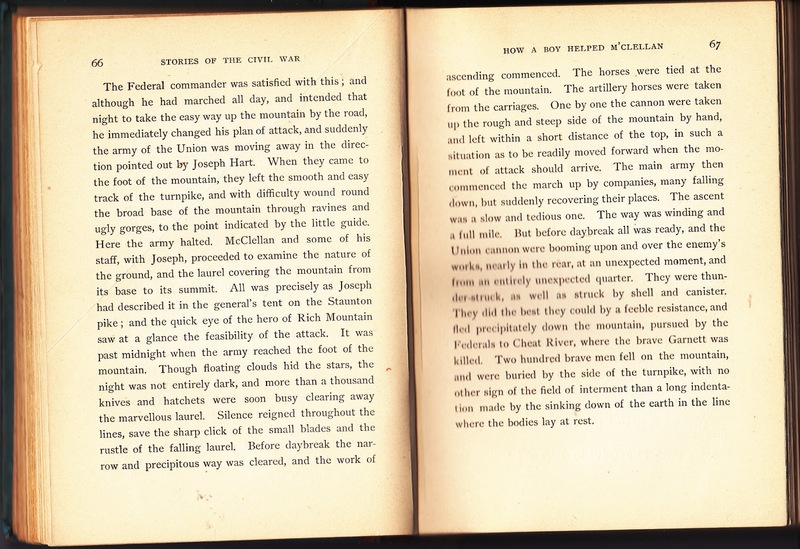 All is not battlefield material in the book. There are a few on Abraham Lincoln, as well as an "old Abe" of a different sort in "Old Abe, the Soldier Bird." My copy is "Adapted for Supplementary Reading" and is the same as this Hathitrust online version. The fact that my book's cover advertises itself as "Classics for Home and School" gives you a clearer idea of the type of material...definitely reader friendly. Of course, the "Price 35 Cents by Mail" also shows it was marketed to the family and not the researcher. Today that sort of research delights me, whether as Liberetta or my more generic "One Room Schoolteacher." Happy 4th of July celebrating what Liberetta grew up calling the War of Liberation, even as she called the Civil War "The War of Rebellion." 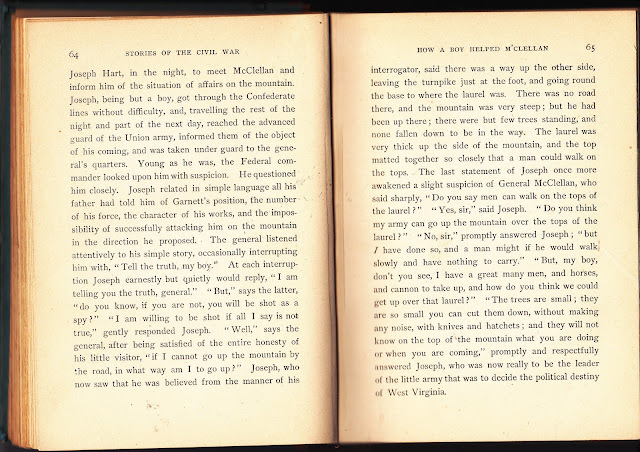 Of course in the South it was called "The War of Northern Aggression", so viewpoints differed, but I think all will agree when Liberetta says, "There was nothing Civil about that war." May your holiday be peaceful.